Farrar, Straus and Giroux (BYR), 9780374348809, 40pp. A battle of the magnet letters ensues across the refrigerator door in May I Have a Word? when C and K get into a fight about who gets to start the cooler (kooler?) words. When the two letters storm off in opposite directions, everything is turned upside down. SOCKS are now SO, there aren't any CLOCKS to TICK or TOCK, and the world is just out of LUCK--until other letters work to bring C and K back together again. 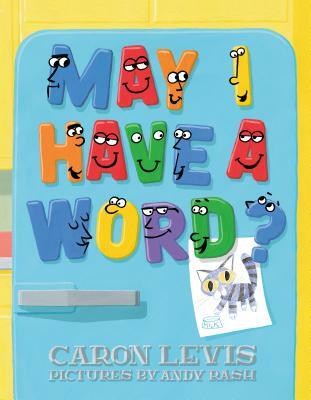 Caron Levis is a children's book author, short-story writer, and playwright living in New York City. She is the author of May I Have a Word? and Stuck With the Blooz. Andy Rash is a freelance illustrator, animator, and children’s book author with over fifteen years of experience in publishing. He is the author and illustrator of Archie the Daredevil Penguin, Ten Little Zombies, a Love Story,Are You a Horse?, Agent A to Agent Z, and many more.